Spring break is over. It’s time to get serious about those research papers that are coming due. But where to start? Your professor wants you to use scholarly articles but what are those and where do you find them? You start right here at the library research portal, research.udmercy.edu. Simply click on the third tab, Article, Journals + Databases. The UDM Databases are searchable collections of full-text journal articles, abstracts (article summaries), or citations. They have gone through an evaluative process before publication and that is, in part, what makes them scholarly. So is your research paper on a Psychology topic? How about Social Work? Maybe a paper for an Education class? If you clicked on the Articles, Journals + Databases tab, you should see Find articles in Library databases with Databases by subject beneath it. Click on the drop down arrow and select the most appropriate subject area for your paper. 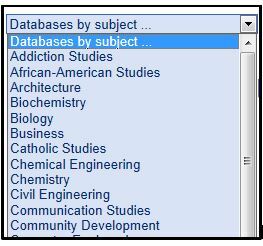 When you click into one of these subject areas, you will be given a list of databases that contain articles specific to that subject area. So for example, if you select Psychology, databases such as PsycINFO, Psychology and Behavioral Sciences Collection, and Psychology Collection (Gale) are among the databases available for researching Psychology related topics. Click into one of those databases and begin using keywords to search for articles on your topic. To be sure you find full-text articles, when you enter your search terms, look for the option to limit your searches to full-text only. Then your results will contain only citations that have the full-text of the article available through that database. For more information to begin your research, contact the librarians at 313-993-1071.